Core to the Salsa is Facebook integration– it works beautifully using the Facebook button – just press in the gallery or browser and you’ll be able to share that site or picture on your social network. Along with Android Gingerbread and the excellent Sense UI, this smartphone is a cinch to use and set up. The five-megapixel snapper won’t set you on fire, but it’s adequate for taking snaps. This is a mid-range handset with all you’d expect in the way of email and web features, plus an LCD display that offers a decent resolution considering the price. The touch-screen keyboard proved itself speedy and responsive, and finding our way around the phone was a user friendly and smooth process. But the 800MHz chip is not so speedy, and we found in-browser Flash just too jerky to view. Battery life is excellent, and you’ll find you can get through more than a day before you have to charge. Does the idea of a Facebook phone have you tutting to yourself? We know – they’ll be making a movie about the social network site next won’t they? Anyway, putting that cynicism to one side, we know that the youth market is big on social media, so it is no surprise that the mobile arena has grasped this and endeavoured to make its own mark. And here it is in the shape of the HTC Salsa – a neat device that holds Facebook integration at its core but offers enough to make it a viable handset in its own right. The first thing of note about the HTC Salsa is its dimensions, While it features a good-sized 3.4in touch display, it still manages to be neater than many of its rivals. It measures just less than an inch thick and weighs in at just 120g, so it’s pleasingly compact in the hand. We now expect HTC handsets to boast an aluminium unibody, and it is indeed pretty solid – turn it over and you’ll see some darker plastic panes that look a bit like a patchwork pattern – you’ll either love it or hate it, we reckon. Another release from HTC, the ChaCha, has a QWERTY keyboard, but the Salsa relies solely on the touch display – you’ll find back, search and home screen functions all at the bottom of the screen. There are some physical buttons – a volume rocker, camera button (hooray!) and of course that Facebook button on the bottom lip. It’s not too overbearing, which you may have feared when you heard the phrase ‘Facebook phone’. All in all, it boasts an elegant design that is both small and solid, which manages to make some of its rivals look a bit overweight. Social networking is at the heart of this handset. Press the Facebook button and you’ll be able to send a status update to your wall – or indeed to your choice of friend’s wall – with just a few clicks. If you like taking snaps or video with your camera phone, it’s easy to upload them to Facebook. You’re also able to back up your images to Facebook – not a good idea if you’d rather some didn’t see the light of day! Listening to a great track on the Salsa’s media player? Press the F button and you can share it with your Facebook crew. Just make sure it isn’t anything too embarrassing! You can also sync contacts on the Salsa and you’ll see your Facebook friends have appeared in the contact book; plus their birthdays will have been put on your calendar – great if you generally use Facebook for reminding you about these special dates. If you’ve used a HTC handset before, you’ll have encountered the Friend Stream widget, which aggregates all your Flickr, Twitter and Facebook info such as posts, messages and so on into one feed – excellent if you have a presence on several social network sites. These can be filtered by photo, video, link or status update. You can also use the built-in Facebook Chat app, but be aware that it is apt to go offline or close down, and it also often defaults to online mode, which means that you are likely to encounter a number of open chat windows next time you log in via the internet. So there are plenty of functions to give you access to your social life online. At the top left of the display you’ll see a nifty notification bar, which brings together SMS, synched email accounts and all that’s happening on your networks. It gives you the chance to feel like you’re the ruler of your own little online domain, with an omnipresence that you couldn’t get elsewhere! What the Salsa really does well is playing up to the immediacy of the social network site. Browsing the net and you encounter a fun link or interesting video? Press the Facebook button and it will drag the link to the ‘post’ facility. If you like sharing links, pictures and video, and love being the first to do so among your virtual social circle, you’ll love this. It is also possible to change the link’s thumbnail and input a comment, just as you might do on the internet – it’s an added touch that shows just how much thought has gone into bringing this Facebook functionality to the Salsa. Whatever you choose to do – post a video, link or image – it’s easy to get to grips with, and works smoothly and quickly. But while the Facebook button is the Salsa’s USP, let’s not forget that the Salsa is a top mid-range Android smartphone, boasting the latest operating system for Android – Gingerbread 2.3.3 – and the latest incarnation of HTC’s Sense user interface. Sense is amazingly intuitive, and easy to customise, plus there are built-in apps that offer pretty much all you could want – including an FM radio player, Google Maps, News and Weather feeds and YouTube browser. And of course you have access to more than 300,000 apps at Android Market. Anyone who has used Android handsets will be familiar with the seven home screens – all of which are customisable – and to which you can add your choice of folders, shortcuts and apps. The five-megapixel snapper is merely adequate compared with the cameras on more expensive smartphones, but it is good enough for quickly uploading pictures to the internet. The handset can also record 480p (720x480) video and also features a front-facing VGA camera for making video calls. At this price, you might not expect the screen to be that great. And while it’s not up there with the Super AMOLED or Retina Display, nevertheless the 320x480 pixel LCD screen does a good job – colours appear vibrant, although you may find you need to zoom in a little (just pinch to zoom) if you are looking at webpages. Battery life is also impressive – you’ll get a good day and more out of a full battery charge. The on-screen keyboard proves responsive, so that inputting posts and updates is simple. You won’t be drooling over the HTC Salsa if you’re really after a dual-core handset – its 800MHz chip is not the fastest out there, but it doesn’t really have to be. But do be aware that its slow speed means that you won’t be able to watch Flash videos in-browser. What HTC has tried to do with the Salsa is produce a phone that has Facebook at its core, while still doing everything else you’d expect from a mobile device. And it does just that. Its features manage to ensure your virtual interactions work smoothly and easily, so that you’ll interact and share more. But it’s more than a good social network phone –it’s also a great Android handset with excellent battery life, a vibrant screen and a decent choice of apps and features on board. 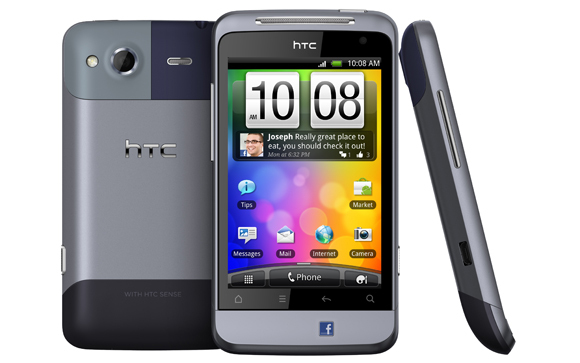 All in all, if you’re a Facebook fan who’s after a good all-rounder, the HTC Salsa is the phone for you.